The human body secretes and circulates some 50 different hormones. A wide variety of these chemical substances are produced by endocrine cells, most of which are in glands. 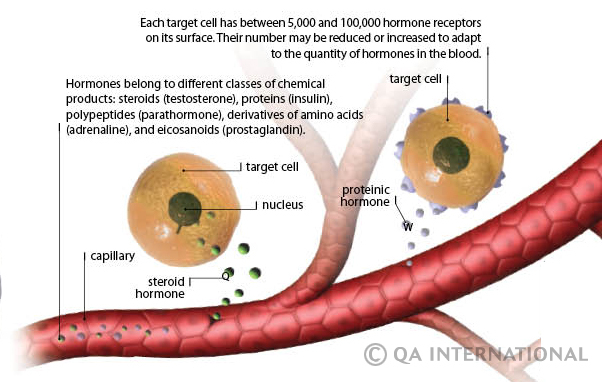 The hormones then enter the blood system to circulate throughout the body and activate target cells. The endocrine system, tightly linked to the nervous system, controls a large number of the body’s functions: metabolism, homeostasis, growth, sexual activity, and contraction of the smooth and cardiac muscles. The endocrine system is composed of nine specialized glands (the pituitary, the thyroid, the four parathyroids, the two adrenals and the thymus) and a number of organs capable of producing hormones (including the pancreas, heart, kidneys, ovaries, testicles and intestines). The hypothalamus, which is not a gland but a nerve center, also plays a major role in the synthesis of hormonal factors. Located under the thalamus, the hypothalamus is composed of several nuclei that control the autonomic nervous system and regulate hunger, thirst, body temperature and sleep. The hypothalamus also influences sexual behavior and controls the emotions of anger and fear. 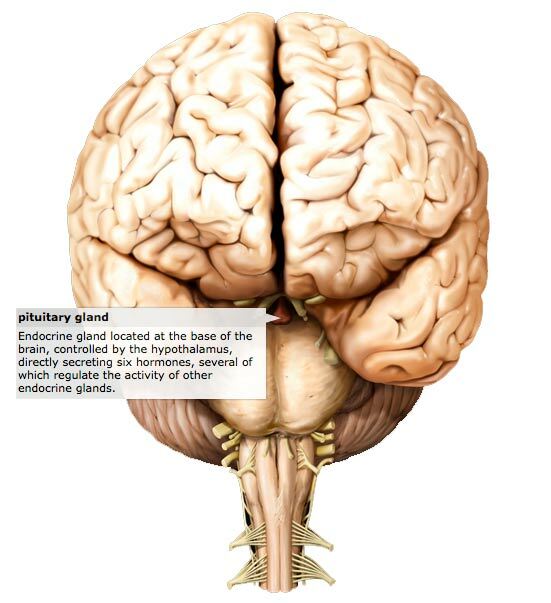 Closely linked to the pituitary gland, it acts as a coordinator between the nervous and endocrine systems. 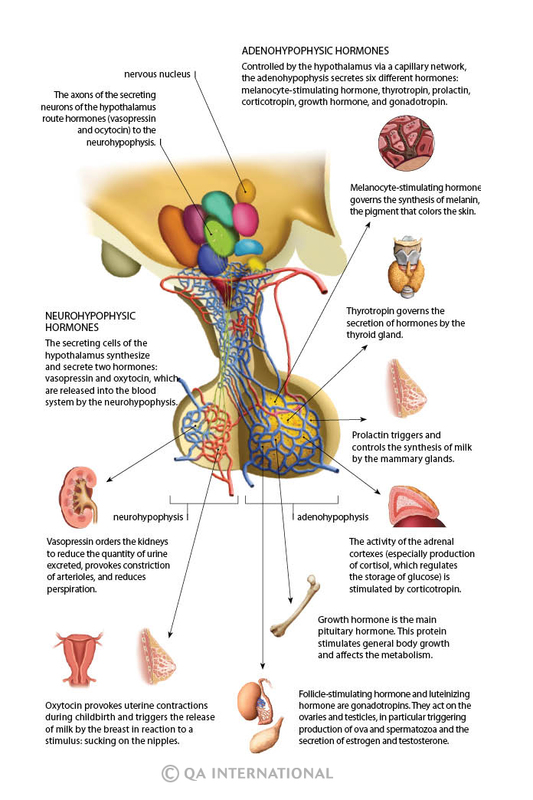 Generally considered the master endocrine gland, the pituitary secretes 10 different hormones. Some of these substances then act on the other endocrine glands. Unlike substances produced by the exocrine glands, which flow through ducts, the hormones are released directly into the space that surrounds them by secreting cells. The very high vascularization of endocrine glands enables hormones to spread throughout the blood system via the capillaries. Some of them circulate freely in the blood, while others must attach to carrier proteins to reach the target cells. When a hormone diffuses outside of a capillary, it can act on a target cell – a cell with receptors that correspond to it. There are two types of hormonal activity. A steroid hormone is capable of crossing through the cell membrane of the target cell. It unites with a receptor protein located inside the nucleus, which stimulates or blocks the cell’s genetic activity. A protein hormone, on the other hand, cannot penetrate the target cell. It attaches to the cell’s membrane and activates a receptor that releases, in turn, a messenger within the cell. Hypothalamus: All the small formations of gray matter located beneath the thalamus, controlling the hormonal secretions of the hypophysis and the activity of the autonomic nervous system. 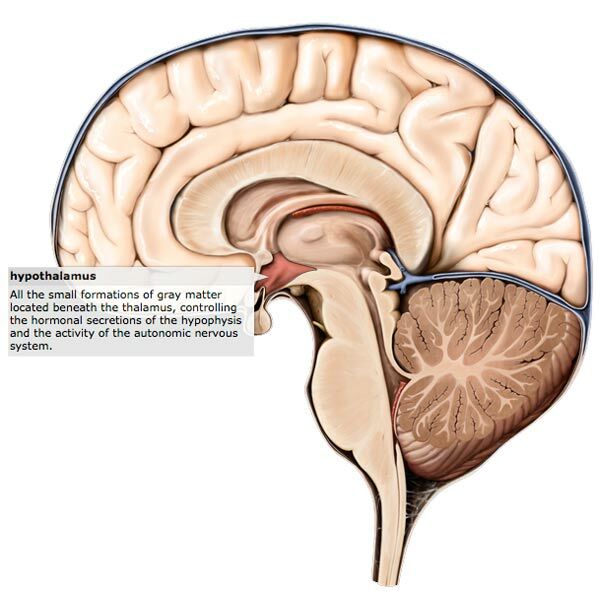 Thalamus: All the many formations of gray matter located at the center of the brain.